The new report, ‘The Financial System We Need’, released today in Lima, Peru by the UNEP Financial Inquiry, suggests that there is now an historic opportunity to shape a financial system that can more effectively finance the development of an inclusive, green economy. There is an increasing effort to integrate sustainability factors into the rules that govern the financial system from central banks, financial regulators and standard setters. For the first time, the UNEP Inquiry has drawn together practical examples of policy changes in banking, capital markets, insurance and institutional investment, drawing on detailed work in countries such as Bangladesh, Brazil, China, Colombia, France, India, Indonesia, Kenya, South Africa, the UK and the USA. 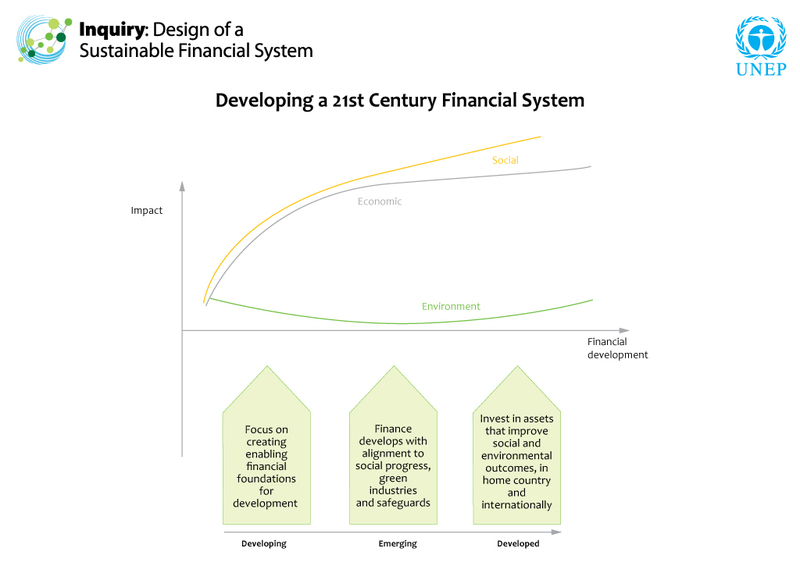 Key findings of the report suggest that a ‘quiet revolution’ is underway as financial policymakers and regulators take steps to integrate sustainable development considerations into financial systems to make them fit for the 21st century. The report also indicates that momentum is building and is largely driven by developing and emerging nations including Bangladesh, Brazil, China, Kenya, and Peru, with developed country champions including France and the UK. “UNEP's Inquiry has for the first time compiled and analysed inspiring initiatives from across the world that seek to better align the financial system with sustainable development, showing that there is much to be learnt from the developing world”, said Achim Steiner, UN Under-Secretary-General and Executive Director of UNEP. Yi Gang, Deputy Governor of the People’s Bank of China, said of the UNEP Inquiry report, "it delivers a vision of embedding sustainable development into the core of financial and capital markets. It should be a very useful guide and reference for many governments, financial institutions and international organisations in thinking about how to advance green finance”. Along with report, the Inquiry has also launched the ‘Inquiry Live’ website which houses the body of knowledge and research materials encompassing the Inquiry’s work over the past 20 months. The website provides a one stop shop to all of the Inquiry’s research materials, as well as a dedicated portal for partner countries to enable communication and sharing of knowledge. The country portal will initially be dedicated to the 15 countries where there has been enhanced country engagement. To learn more about the UNEP Inquiry, visit the 'Inquiry Live" website at - www.unepinquiry.org. The report 'The Financial System we Need' can be accessed in the GGKP Resource Library here.